PJSC “Ilyushin Aviation Complex“ joined the Moscow campaign traditionally held by the Department of Science, Industrial Policy and Entrepreneurship together with enterprises of Moscow industry. The aviation enterprises of the capital, including PJSC “IL“, take an active part in it. For our guests we gave a tour around the strength testing laboratory, where the aircraft is subjected to loads identical to those it receives in the air. It is considered that this complex is the largest in Europe. The aircraft IL-76TD is suspended there on a special cable system, and is a subject to loads to determine the ultimate life of the airframe. In addition, the high-lift system of the wing of the advanced light military transport aircraft IL-112V and other components and assemblies are being tested there to verify the correctness of the calculations made by the Experimental Design Bureau of PJSC “IL“. 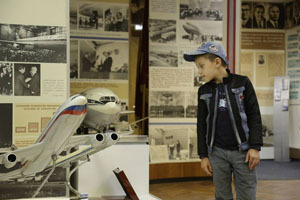 Also, an excursion to the Museum of PJSC “IL“ was conducted for the visitors of the enterprise. It contains unique exhibits from the history of the enterprise and shows the milestones of creating the legendary aircrafts. One of the halls of the Museum — is the office of Sergei Vladimirovich Ilyushin, which remained unchanged since the legendary designer left him. Source: PJSC ”Ilyushin Aviation Complex”.